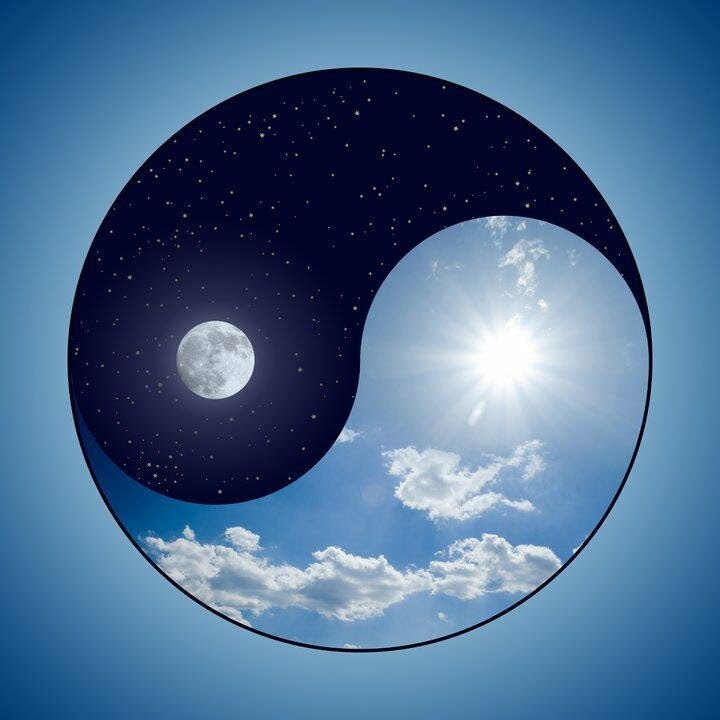 Yin and Yang: "Regard All Dharmas As Dreams." The slogan, "Regard all dharmas as dreams" is the second slogan out of fifty nine in the Tibetan Buddhist mind training (Lojong) practice. My first question is what is dharma? Today I did some online searching of the meaning of the word and discovered, as I had already vaguely knew, that the word has many, many meanings. Wikipedia states, "There is no single word translation for dharma in western languages." Google puts up just two meanings - "1. Hinduism: the principle of cosmic order. 2. Buddhism: the teaching or religion of the Buddha." Another translation of this slogan is, "Regard all phenomena as dreams" which implies that dharma can be seen as all phenomena. When I looked for a google image for dharma I found the Chinese religious symbol of the bagua, a yin/yang symbol in the center surrounded by the eight trigrams of the I Ching. 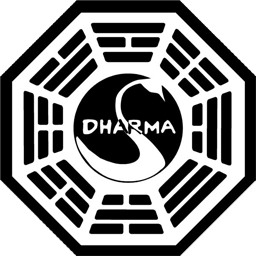 Then I saw the image I posted above with the word Dharma in place of the yin/yang symbol. Based on some of this information I could say that dharma has something to do with the basic qualities of life which include much balance and order. If there weren't much balance and order we would not be able to orient ourselves, we would not be able to perceive, interpret and act upon life. There would be chaos without identifiable phenomena. The Buddha's teachings are based on an interpretation of the phenomena we call life. Both the Buddha's teachings and life are the dharma. So the slogan instructs to regard Buddha's teaching and life as a dream. But what is a dream? We know we can dream while awake or asleep. Some of us know that dreams are not reality. Dreams are an illusion for many and can turn into a delusion for those who lose their mental balance. Dreams can come to us while sleeping from some unknown place of conception. How sleep dreams are created, we do not know, but they involve us in remembered elements of our daily lives and turn those elements into something symbolic. Dreams can be powerful and can direct our thoughts and speech and actions after we wake up. Dreams are mysterious. We respond to dreams with all kinds of emotions from fear to anger, from sadness to joy. Dreams can be logical and dreams can be absurd. If we are to regard life as a dream, it would include all of this, power, mystery, logic, absurdity, the capability of stirring up emotions and questions, yet at the same time all of this would have no substance. We place a great deal of value on substance, on "reality". People like myself who have for periods of time lost reality by being consumed by delusions know how precious is the balance of perceiving truly. We see our lives as the ultimate reality. But what if what we perceive and see, hear, feel, smell and taste is not reality? If life is not real, then what is real? We base our thoughts, speech and actions on our perceptions when our ability to perceive is faulty. We misinterpret people and life situations all the time. The worst example of this insanity is when people volunteer or are coerced to engage in war. For too many insanity is what life is about. I think the yin/yang symbol and dharma point to reality. For us, it appears to be a higher reality, some kind of Nirvana/heavenly place of peace, balance and joy. Our "reality" has a lot of violence, imbalance and pain in it. Because our perceptions are off, we create a great deal of the violence, imbalance and pain, but far too few are willing to claim responsibility for this. Reality is not truly higher, it just is what it is. But we block ourselves from it by being so adaptable. We adapt to each other's misperceptions (which invariably lead to many illnesses) and perpetuate the illusions that we know what reality is, when we don't. The slogan to regard life as a dream was formulated to challenge our assumptions that we know what life means, that we are in touch with reality. If life is a dream for the human animal, the next question is how do we wake up to experience the true reality? I have seen myself as experiencing everything with partial blindness, which is why I rely so heavily on intuition and insight, which I believe comes from a higher source. And yet, I am not totally blind. The Lojong slogans are other human beings' attempts to stir up our intuition which can lead us to insight which can lead to a change of perspective which can lead to waking up and clearly seeing, to enlightenment. But first we must see and acknowledge the core of the problem and that is we do not live our lives in reality. Yes, we have real moments, but they pass and are obscured by so many misperceptions. We do not see truly. Sometimes we do not see at all.